1st Iowa Battery: At Vicksburg, Mississippi with four 6-pdr field guns and two 12-pdr field howitzers. The battery remained with First Division, Fifteenth Corps. Captain Henry H. Griffiths commanded. 2nd Iowa Battery: Reporting from Bear Creek, Mississippi with two 6-pdr field guns and two 12-pdr field howitzers. Lieutenant Joseph R. Reed commanded this battery. In April, the Eighth Division, Sixteenth Corps transferred to become the Third Division, Fifteenth Corps. 3rd Iowa Battery: At Helena, Arkansas with four 6-pdr field guns and two 12-pdr field howitzers. Captain Mortimer M. Hayden commanded this battery. The battery was assigned to the Twelfth Division, Thirteenth Corps, carried on returns as the District of Eastern Arkansas. “2nd Cav. Arty. Stores.” – A location of LaGrange, Tennessee and with two 12-pdr mountain howitzers. The 2nd Iowa Cavalry was part of Grierson’s Raid in April-May 1863. 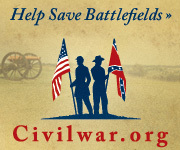 Colonel Edward Hatch’s regiment was detached early on the raid to distract Confederates and returned to Grand Junction. As for the two cannon? More on this below. “41st Iowa Infy.” – At Fort (Illegible), D.T…. Dakota Territory… with one 12-pdr mountain howitzer. The 41st Iowa Infantry Battalion was formed from three companies out of the 14th Iowa in December 1861. Posted to the Dakota Territories, the battalion was later transferred to the 7th Iowa Cavalry. Nothing very specific here. The 2nd Iowa Cavalry would have, according to the clerks, two prairie carriages and two prairie ammunition carts. The 41st Iowa Infantry (7th Iowa Cavalry if you prefer) had one 12-pdr mountain howitzer carriage. The 2nd Iowa Cavalry regimental history indicates at least one of the 2-pdr Woodruff guns were detailed to the regiment during Grierson’s Raid. 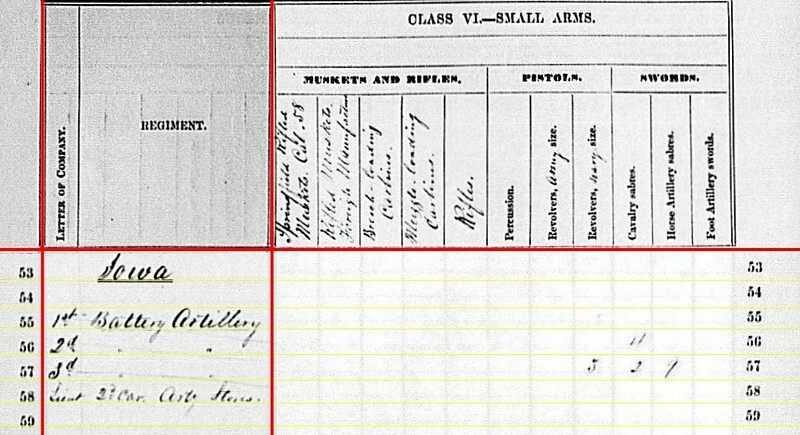 So one, maybe two, of those small cannon must have still been on charge at reporting time in June 1863. And I think this is why we see the distinction of prairie carriage and cart. Not a lot to go on – regimental history and the odd behavior of the clerks. But we do know the regiment was associated with the Woodruff gun at least for a short period adjacent to the reporting date. Still, I have room for doubt. The clerks usually carried, if they did at all, Woodruffs on the Union Repeating Gun column. Furthermore, as we will see with the ammunition reported, there are other mis-matches to reconcile here. As for the 41st Iowa Infantry, certainly would make sense for a unit on the frontier to have a mountain howitzer on hand. Digging deeper, I found a pendulum hausse for 12-pdr mountain howitzer among the other equipment reported by the 41st. So I am apt to mark this as very a correct entry line – the 41st must have had a mountain howitzer. 1st Battery: 400 shot, 320 case, and 82 canister for 6-pdr field guns; 120 shell, 160 case, and 42 canister for 12-pdr field howitzers. 2nd Battery: 111 canister for 6-pdr field guns; 74 canister for 12-pdr field howitzers. 3rd Battery: 315 shot, 303 case, and 114 canister for 6-pdr field guns; 109 shell, 156 case, and 32 canister for 12-pdr field howitzers. 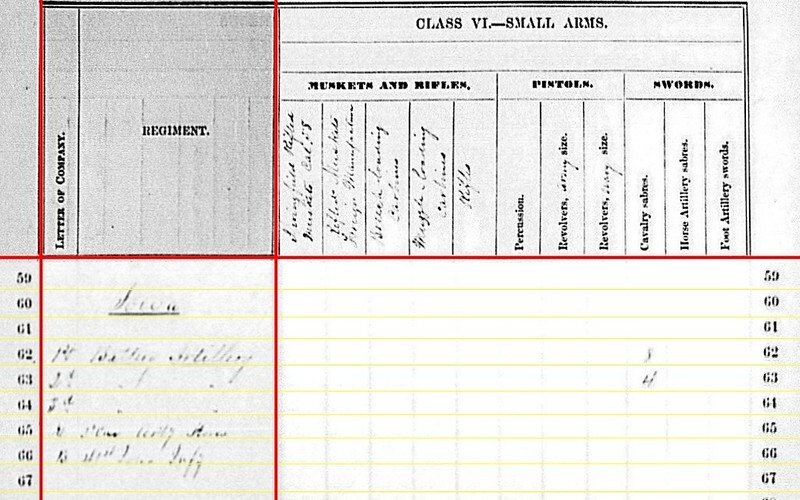 2nd Iowa Cavalry: 12 shell, 108 case, and 24 canister for 12-pdr mountain howitzers. 41st Iowa Infantry: 55 shell, 12 case, and 40 canister for 12-pdr mountain howitzers. First note – I’ve assumed here the 12-pdr canister quantities were matched up with the field howitzers. We’ve seen before the clerks often used those columns as either/or for 12-pdr Napoleons, 12-pdr howitzers, and 12-pdr mountain howitzers. So I’m not too concerned about those entries. If we read these directly, the 2nd Battery had only canister for their weapons while working the lines at Vicksburg. And with ammunition reported by the 2nd Iowa Cavalry, there’s 144 arguments saying “12-pdr mountain howitzers” used by the troopers. But, moving on to the rifled projectiles we find… nothing! The Iowa artillerists were not trusted with rifles, I guess. I’ve posted the pages (one, two, and three) for those who like to look at blank pages. 1st Battery: Eight cavalry sabers. 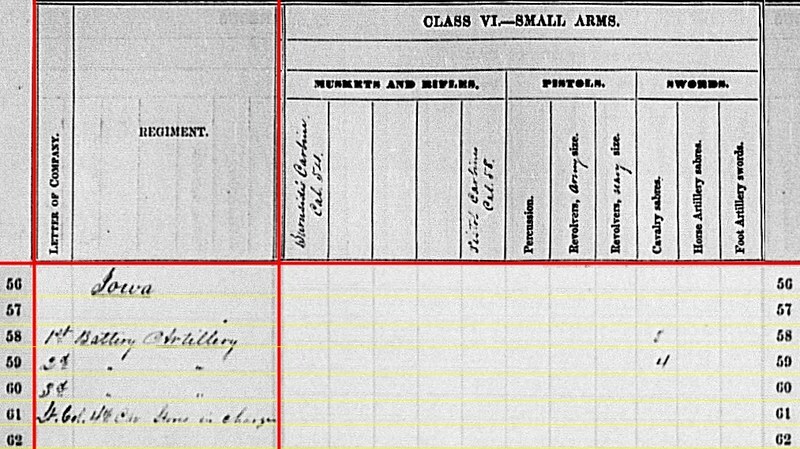 The Army trusted the Iowa artillerists with edged weapons, but not pistols. The next state’s batteries listed in the first quarter, 1863 summaries was Iowa. Yes, we have Iowa following Illinois and Indiana saved for the next set of pages. The clerks at the Ordnance Department were not concerned with alphabetical order. They wanted to maximize space utilization on the form. After all there was a war on and must have been some paper shortage, right? 1st Iowa Battery: At Sherman’s Landing, Louisiana with four 6-pdr field guns and two 12-pdr field howitzers. Sherman’s Landing was near Young’s Point, where the battery supported First Division, Fifteenth Corps. Captain Henry H. Griffiths commanded. 2nd Iowa Battery: Reporting from Young’s Point, Louisiana with two 6-pdr field guns and two 12-pdr field howitzers. Lieutenant Joseph R. Reed commanded this battery, part of the Eighth Division, Sixteenth Corps. 3rd Iowa Battery: At Helena, Arkansas with four 6-pdr field guns and two 12-pdr field howitzers. Captain Mortimer M. Hayden commanded this battery. It was assigned on paper to the “new” Thirteenth Corps, but operated as part of the District of Eastern Arkansas out of Helena. 4th Iowa Cavalry: Stores in charge, no guns tallied on the summary. We’ll look at this entry in detail later. The regiment served under Lieutenant-Colonel Simeon D. Swan during the winter, mostly operating around Helena. So three batteries, all reporting a mix of 6-pdr field guns and 12-pdr howitzers. We can make short work of this, right? 1st Iowa: 400 shot, 320 case, and 80 canister for 6-pdr field gun; 120 shell, 160 case, and 42 canister for 12-pdr field howitzer. 2nd Iowa: 142 shot 160 case, and 111 canister for 6-pdr field gun; 120 shell, 120 case, and 74 canister for 12-pdr field howitzer. 3rd Iowa: 375 shot, 299 case, and 85 canister for 6-pdr field gun; 95 shell, 66 case, and 32 canister for 12-pdr field howitzer. I would point out the 1st Iowa’s quantities are the same as reported the previous quarter. The other two reflect changes of ordnance on hand. As expected, there were no quantities of rifled projectiles on hand. I’ve posted the snips to prove it (here, here, and here). 1st Iowa: Five cavalry sabers. 2nd Iowa: Four cavalry sabers. A short discussion for those three batteries – ten 6-pdr guns and six 12-pdr howitzers along with well stocked ammunition chests and a handful of sabers. On the 8th of March , a detachment of two hundred and fifty men of the Fourth Iowa, commanded by Major Spearman, forming part of a column under Major Walker, of the Fifth Kansas Cavalry… had a skirmish with the rebels at Big Creek, about ten miles west of Helena. The creek was impassable, and the enemy were on the opposite side. Private Benoni F. Kellogg, of L, a popular soldier was killed, but no one else was struck. Kellogg’s comrades, unwilling to leave his body, lashed it to one of the “Woodruff” guns, and so brought it into camp, where they buried it with honors. The Woodruff guns were three small iron pieces, throwing a two-pound solid shot, which about this time in some way came into the hands of the regiment. They were placed in charge of Private “Cy” Washburn, of B, who had a few men detailed to assist him. They were of no value, and were generally voted a nuisance. They were never known to hit anything, and never served any useful purpose, except in promoting cheerfulness in the regiment. The men were never tired of making jokes and teasing Washburn about them; but he was proud of his artillery, and thirsted for an opportunity to justify its existence. When the regiment left Helena he was not permitted to take it along with him; but he pined for a gun, and in the Vicksburg campaign he was given a small brass piece, captured at Jackson, upon which he organized another “battery” and considered himself handsomely promoted. An opportunity for glory came suddenly one fine day, but before it could be fully achieved the unfeeling rebels carried off Washburn, battery and all. Poor Washburn. I am certain readers can sympathize with this eager artillerist diligently working to enlighten the wooden-heads of the mounted arm as to the value of artillery. Yet, when given a chance to demonstrate on the field of battle, his opportunity foiled. But we do have some clean evidence to support speculations. The regimental history mentions three Woodruffs. We see indications of three “sets” of equipment with the regiment. 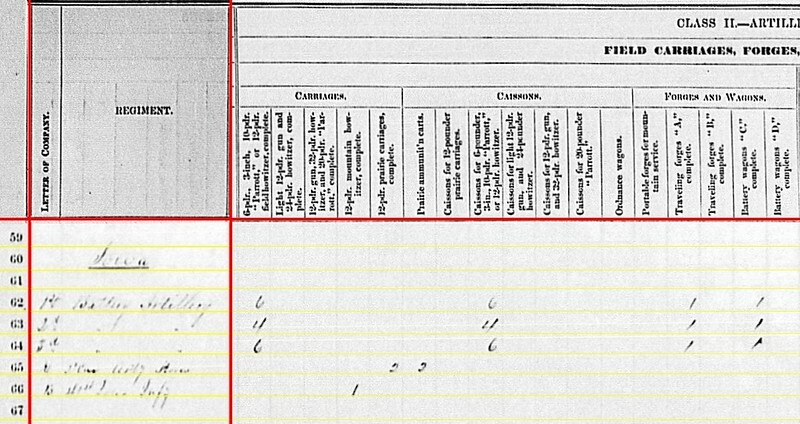 And we know the guns were employed in March 1863… though not in the manner designed for. Regardless, such fills in some blanks left on the summaries.